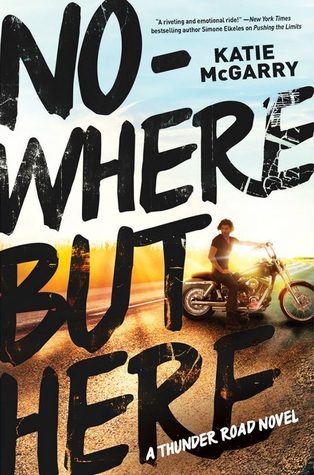 Welcome to the Philippine blog tour of Katie McGarry's newest novel, Nowhere But Here! Check out my thoughts about the book below and a giveaway! *This review is based on advanced reading copy. There might be some changes with the finished copy. I am familiar with Katie McGarry's writing style even though I've only read one book from her (Pushing The Limits) and reading Nowhere But Here is both familiar and new. Nowhere But Here, like PTL, has major issues, hot romance, but it has more angst that it turned out to be more mature. Being not personally and emotionally attached to her biological father, Emily doesn't care or even interested to get to know him or his family more even though she doesn't have choice by having a "vacation" with them. I saw how she hates her father for leaving them and to his family when they don't want her and her mother. She's a little brat towards these people but turns out to be understandable because of how she sees them. What she didn't know is that in this vacation opportunity will she find out the truth about her and her parents' past. I like that she didn't remained as she was on the beginning. She had character improvements which is really good. Oz has one goal in life: to be part of Rein of Terror, a motorcycle club he's looking up for all his life. But when Emily arrived, trouble followed their lives. Oz is your typical bad-boy-got-soft-side kind of guy. He's all man (and hot) as described by Emily, he rides motorcycle and wants to be part of a club with 'Terror' in their name, but he cares deeply for his family and also kids. Nowhere But Here deals mostly about the truth (or finding out about it) and family. Integrity. It also has hot romance in a Katie McGarry kind of way. There were only little info about the motorcycle clubs compared to I was expecting. It only kind of stated the facts but wasn't shown greatly in the book, they are all names and patches and leather black jackets but nothing major happened. Except they danced around the truths and lies. I like Nowhere But Here because it shows the importance and beauty-ness of [having] family despite how at some points they become untrue. I like how from nothing, there came love and caring between the characters and how almost everyone grew and matured. The romance was undeniably hot and with chemistry but I feel like it lacks foundation. Maybe because the physical attraction came first than the getting-to-know-each-other. Anyway, Katie McGarry fans would love this. And if you haven't read anything from her, you give this a try and fall in love in the process as well! *Thank you so much Harlequin UK for the review copy in exchange of an honest review!